Street view. Parking available for two cars in front. 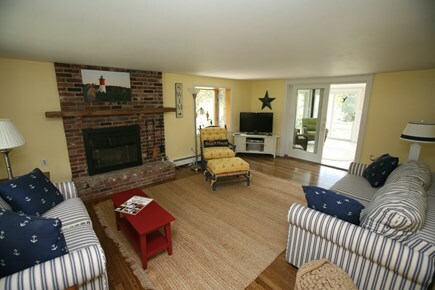 Living room with fireplace, Cable TV, BluRay player, movies etc. 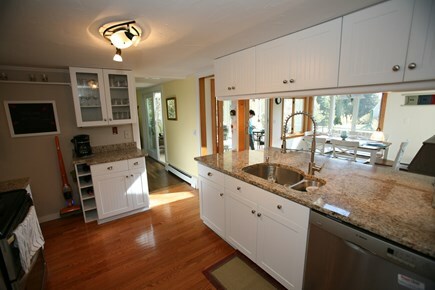 Fully equipped gourmet kitchen. Fridge w/icemaker. 4 season porch. Plenty of light and fresh air! First floor full bath. 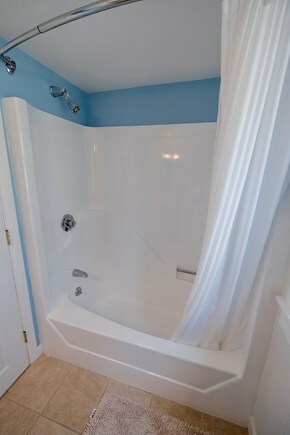 Full bath on 2nd floor as well. 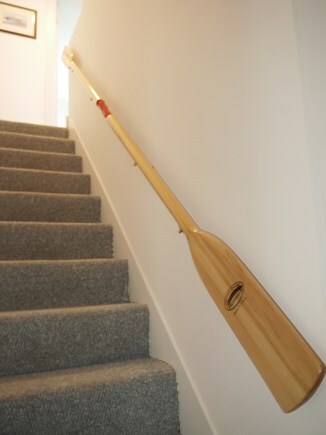 Whimsical stairway to 2nd floor. 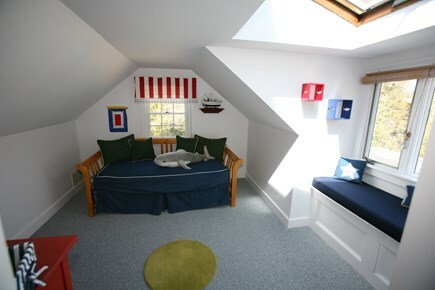 2nd floor/Whale Room: Two twins. Ocean peeks! 2nd floor/Shark Room: Window bench w/ocean views. Mill Pond serenity is a very short walk away! Surfs up at Nauset Beach! 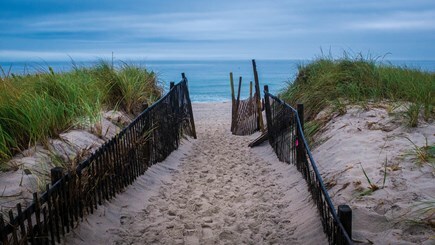 Gateway to paradise at Nauset Beach. Early morning. 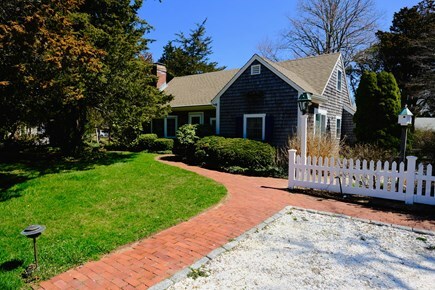 Enjoy everything the Cape has to offer from this recently updated, immaculately maintained 4-bedroom 2-bath classic Cape charmer. Bring your Kayaks as Mill Pond and Roberts Cove are a very short walk away at the end of the block. 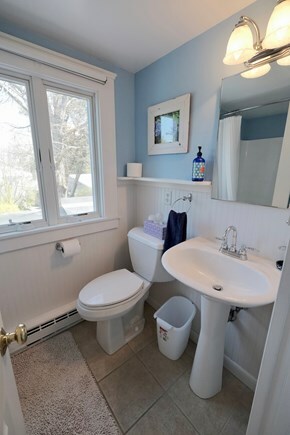 You’ll be close to the surf and sand of Nauset Beach (2 miles away), the expansive tidal flats of Skaket Beach (4 miles away) and East Orleans Village with its great shops, restaurants and the Cape Cod Bike Trail. 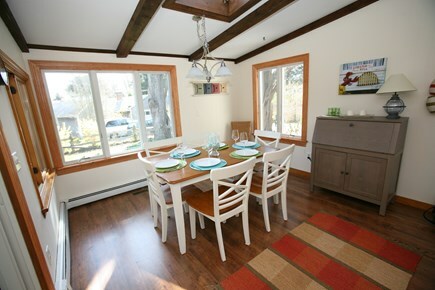 The first floor features a living room with HDTV, Blu Ray and Sonos; a fully equipped modern kitchen, sunny dining room, and a four season sun porch that leads out to the backyard deck. 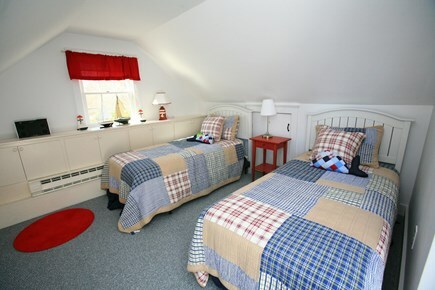 There are two first floor bedrooms and two second floor bedrooms with a full bath on each floor. 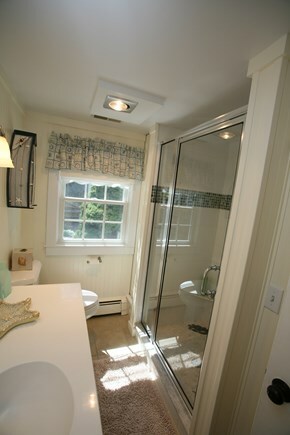 There’s also a unique ‘indoor/outdoor’ shower for that perfect beach house feel. 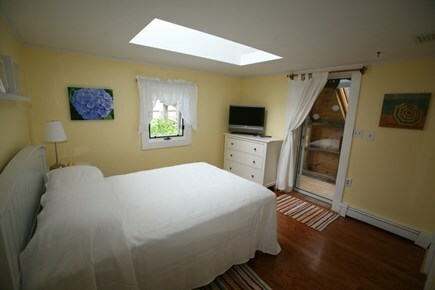 Enjoy Central A/C on those hot summer days or throw open the windows and take in the ocean breezes. Hi-speed wifi is available throughout the house. Outdoors you will enjoy a backyard deck with dining area, Weber gas BBQ, and a secluded corner of the garden that is perfect for enjoying a good book or nap. The quiet country roads are perfect for biking and walking and there are numerous nature trails to explore. 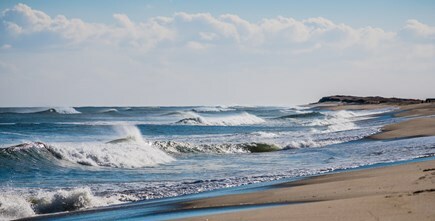 Nearest beach: Nauset beach is 2 miles by bike or car. We love this area of Orleans. It is close to everything Orleans has to offer. 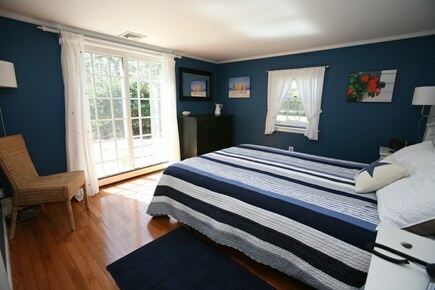 Nauset beach is 2 miles drive (the ocean is viewable from 2nd floor bedrooms) and Skatet Beach is 4 miles drive. A short 5 minute walk to the end of the block for kayaking and the wildlife around Roberts Cove and Mill Pond or stroll over to Snow Shore landing for spectacular views across the water. This is a very quiet location. 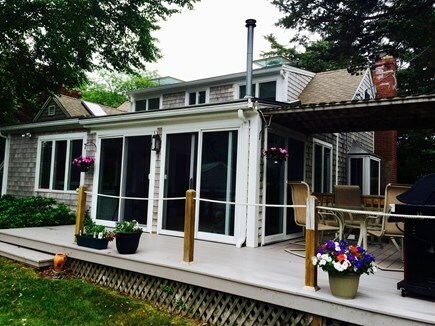 We enjoy sitting in the sunroom with the windows and skylights open or on the deck listening the sound of the surf on Nauset beach. 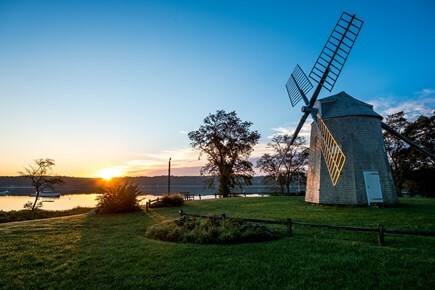 The charming hamlet of East Orleans is 5 minutes away and offers a variety of small shops, restaurants, an ice cream parlor (Sundae School) and pizzeria. 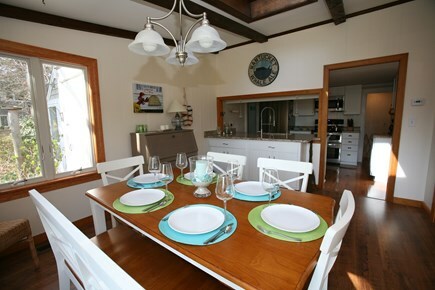 Downtown Orleans is 7 minutes drive and offers everything you need to complete your summer vacation.